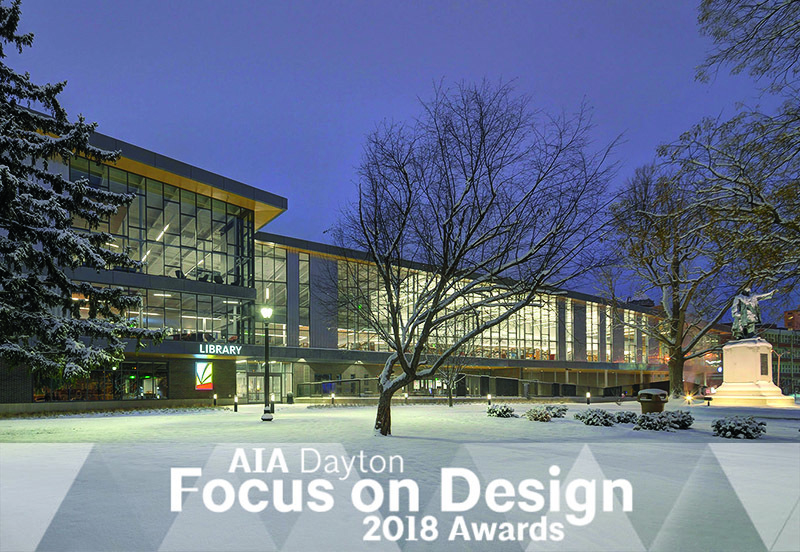 AIA Dayton’s 2018 Focus on Design Awards winners were announced November 8 at the Masonic Temple Center in Dayton. Dayton Main Library received an Honor Award for “Newly Completed Buildings and/or Additions,” among five projects recognized that night for “quality and high performance design.” The award was accepted by LWC, Inc., Group 4 collaborator and project Architect of Record. The awards criteria are based on the AIA’s 10 Principles for Livable Communities, which include: Design at a human scale; Provide choices (housing, shopping, recreation, employment); Encourage mixed-use development; Preserve urban centers; Vary transportation options; Build vibrant public spaces; Create a neighborhood identity; Protect environmental resources; Conserve landscapes; and Design excellence. The principles were first introduced in 2005. Dayton Main Library’s design created a balanced response to each of these principles – including urban infill community enrichment, park adjacency and preservation, LEED-Gold certified sustainable performance, and mix of inspiring, iconic public spaces. More information on the awards is available via AIA Dayton and the Dayton Business Journal. Photo by Ken Schory.